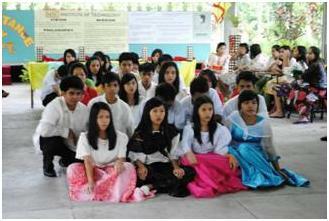 Students of VYP-MSC Institute of Technology went to its San Gabriel Campus donned in Filipiñana costumes of the Spanish Era on June 24 for their Acquaintance Party. Days before the said event, the School Directress Mrs. Lerma S. Prudente announced during the flag ceremony that students must wear Filipiñana attire during the acquaintance party with the theme of commemorating Dr. Jose Rizal’s 150th birthday. Among the activities included in the party were cultural presentations by the students from each year level. The induction of the new set of officers of the high school student council was also held. The party was made more fun by the parlor games sponsored by each class. The highlight of the party was the Search for the Mutya at Lakan wherein the contestants showcased their talents. The MSC High School acquaintance party is held every year so that the students will get to know each other better, thus fostering camaraderie and brotherhood among the students of VYP-MSC IT. This year however, with the added Filipiñana twist to it, the celebration was made even more meaningful for it fostered nationalism that is one of the aims of the administration. This entry was posted in High School and tagged Acquaintance Party, Filipiñana, high school, Lerma S. Prudente, Michael Anthony Dollentes, MSC, san gabriel, san pablo city, Search for the Mutya at Lakan, VYP-MSC Institute of Technology on August 8, 2011 by mscadmin. VYP-MSC Institute of Technology strengthens its vision to be an advocate of environmentally-sound practices and entrepreneurship, and its commitment to provide its students a well-rounded education that will turn them into lifelong learners. Set amidst 1.2 hectares of land, the main school building houses a computer laboratory, a science laboratory and spacious classrooms. The MSC curriculum, laboratory tools and computer equipment, together with all the natural sunlight and fresh air, create an environment that is conducive to out-of-the-box learning. Students conduct researches and projects, learn to effectively express their opinions on different issues, and respond to the call of the global world through interaction with other people throughout the world. Lectures and hands-on experiments also enhance the learning process. Natural sunlight and fresh air, create an environment conducive to non-traditional learning and creative thinking. The free space available also supports freedom of movement and encourages creativity, making the Green Campus ideal for collaborations and group activities. The grounds are also used for various recreational activities, games and sports. The land surrounding the building is teeming with fruit trees and ornamental plants. Students can cultivate and grow their own vegetables in a reserved portion of the land. This is MSC’s way of promoting livelihood education and the entrepreneurial spirits in its students. At the MSC Green Campus, the students not only learn the theories set in the curriculum, but also the build the foundations of being upstanding citizens, caring individuals, God-fearing people, environmentally conscious and active participants in saving the earth. This is, after all what MSC strives for—to be of service to the community, the people and the world. 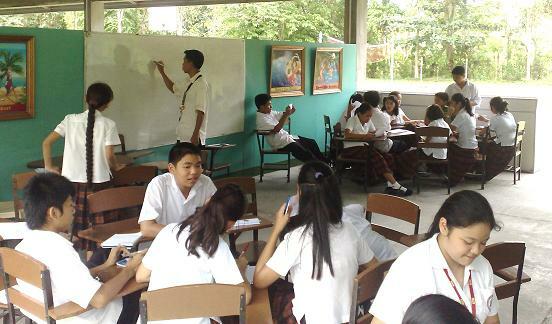 This entry was posted in About and tagged green campus, high school, laguna philippines, MSC, san gabriel, san pablo city on March 27, 2011 by mscadmin.